This is the first of a regular series of posts that will report on the state of the parties as measured by opinion polls. By pooling together all the available polling evidence we can reduce the impact of the random variation each individual survey inevitably produces. Most of the short term advances and setbacks in party polling fortunes are nothing more than noise; the underlying trends – in which we are interested and best assess the parties’ standings – are relatively stable and little influenced by day-to-day events. If there can ever be a definitive assessment of the parties’ standings, this is it. Further details of the method we use to build our estimates of public opinion can be found here. Given that this is our initial post, we thought we should look back on how things have developed since 6th May 2010 when the British public delivered their mixed verdict on the Brown government. While obviously keen to get rid of Labour – which suffered the largest fall in its vote since 1983, to 29.7% – voters were less clear on who should replace Brown’s party in office. The Conservatives increased their support to 37% of votes cast, but this was the lowest share with which the party had ever entered government, and far below the 40% plus it had consistently achieved in the Thatcher-Major years. The Liberal Democrats managed a small increase in support to 23.6%, but were bitterly disappointed that ‘Cleggmania’, which some polls predicated would see the party overtake Labour, ultimately came to so little. With all three main parties finishing the election weaker than they had hoped, the only unambiguous winner on the night was ‘none of the above’, with record vote shares for the UK Independence Party and the British National Party, and a first-ever seat at Westminster for the Greens. In total, parties beyond the big three took a record 9.7% of the vote. So, what has happened since the formation of the Conservative-Liberal Democrat coalition? The chart above shows our estimate of the trends in support for the main three parties. The solid line charts the weekly trend estimate while the dotted lines show the confidence intervals around this estimate. These dotted lines reflect the fact that we can never be entirely certain of the true state of public opinion. Pooling all the polling data together, and modelling it appropriately, we can however be 95% confident that true public opinion falls somewhere within these bounds. The Conservatives started life in power well, with their estimated polling share rising about three points in the first few months of government. Our estimates peak in the early summer at around 40%. Since then, the continuous stream of stories about tax rises, spending cuts and poor economic performance has slowly eroded support for Cameron’s party. This decline seems to have accelerated somewhat since the Comprehensive Spending Review in October 2010, when the full gory detail of the public spending cuts became clear. Our current estimates place them at around 35%, that is two points below where the party stood in May 2010. The Liberal Democrats have also not blossomed in coalition, although their trajectory has been rather different to that of the Conservatives. Our estimates suggest that support for the party declined consistently throughout 2010. The fall is particularly steep soon after the government was formed, perhaps as a result of the angry departure of left-leaning voters who have since 1997 tactically supported Liberal Democrat candidates to keep out the Conservatives. Support continued to decline throughout the rest of the year, however, as Clegg’s party found itself in the firing line over a variety of issues. The nadir was reached towards the end of 2010, around the time of the university tuition fees votes and associated protests. At this point, our estimates suggest Liberal Democrat support was around 7%, that is less than a third of the party’s showing in the general election. Since the start of 2011 the party’s position has slowly improved, perhaps because they have been less prominently associated with unpopular policies. Our current estimate suggests the party now stands at around 9%. The story for Labour has been one of continuous advance, with its poll ratings rising continuously throughout the second half of 2010, picking up on average about 1.5 percentage points a month. By the autumn of 2010 our model estimates Labour was in a statistical dead heat with the Conservatives, with both parties in the mid-to-high thirties. Labour’s advance has since continued, and with the Conservatives now declining rapidly, Labour pulled into a clear lead. 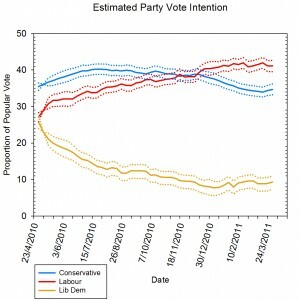 Since January 2011, our model suggests that Labour holds a polling advantage over the Conservatives. The party’s poll numbers have levelled off in the past month or so at around 42%, but with the Conservatives continuing to decline Labour now holds a seven or eight point lead over their main rivals. In other words, in less than a year, Labour has gone from trailing the Conservatives by over seven points to leading them by over six points. This is a remarkable transformation. The story these trends tell is one familiar to students of recent British political history – a tale of voters gradually losing faith in the governing parties and turning to the opposition – although the speed and depth of the process is highly unusual. Perhaps this is due to the context. Voters don’t much like ‘austerity politics’: spending cuts, tax increases and economic stagnation are not an appealing package. The challenge for the Conservatives and the Liberal Democrats in the next year will be to win back support despite having little to offer but more of the same. Our next report will indicate how well they are doing. A version of this post can be found at Polling Observatory. Polling Observatory #4: Sound and fury, signifying nothing? Polling Observatory #7: do conferences make a difference? Next Post Northern Ireland: time for normal politics? This is a brilliant post, and its great to see some reliable estimates, rather than exaggerated reports of error-driven gaps!! Re: Lab and Con support: Labour’s stable support (party ID) was higher than its vote intention before the election – and those voters have simply returned (or at least, this far out from an election still support Labour) and the Conservatives’ stable support was lower than its vote intention, and so its conditional support has simply waned. I.e. Labour lost voters in 2010 but had not really lost them. They were still there, ready to express a willingness to support their party again, made more real of course by the Liberal coalition with the Conservatives. Excellent point Jane. I’m not surprised to learn that there were many “hate Brown, but still like Labour” voters at the last election. I shall have to see if the team can put together a time series of party ID over the past few years to examine this issue in more detail.